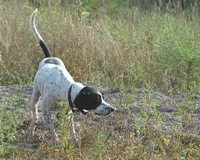 We tag along with some pointers and their people for a late summer quail work-out in advance of the coming hunt season. 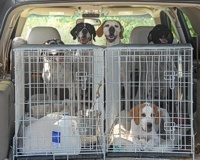 This clan of Pointers has done this a lot, and know the drill about waiting their turn in the SUV. It's warm, but parked in the shade with all the windows open, it's comfortable enough. The 5-month-old pup, of course, gets crate time. 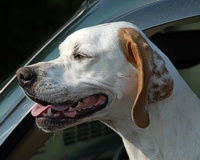 Luna has moved to the driver's seat for a better view of the training prep. Riley bounds through the cover at the edge of the training area. 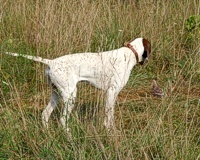 Riley locks up on a planted quail. 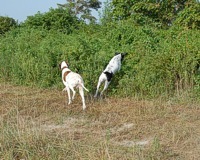 Riley gets a firm, cautionary 'whoa' command from his handler as she approaches to flush the bird. Uma backs Riley. Notice that the more experienced Uma has her tail more relaxed - she's aware that this won't be her bird to work. Ah, maturity. 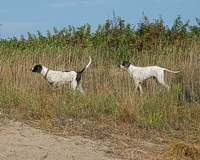 Uma pivots, and stands to watch as her less experienced bracemate can't resist chasing a just-flushed Bob White towards the hedgerow. Gus is getting some â€¦ er â€¦ pointers from Stella on the sort of cover-working drive needed to find those scent cones in still air on a warm day. Into the hedge she goes. 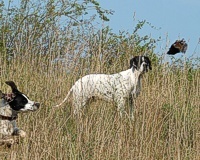 Gus, still getting a handle on things, is learning the required saint-like patience of eyeballing a cheeky quail stolling the grass just two yards away. That's pressure! 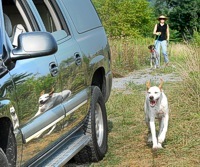 Tattoo the pup has just been visiting with the shorthair walking down the road, and races his reflection past a truck. Tattoo follows his mom, Luna, through the cover, learning to quarter. 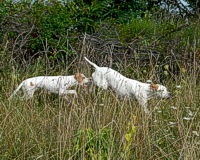 Stella backs Gus on a long-range point. Gus bounds through a stripe of milo, keeping his nose up in the breeze. Laurie kicks to flush the bird Uma's pointing. Riley's being held steady to get a sense of honoring the other dog's work.